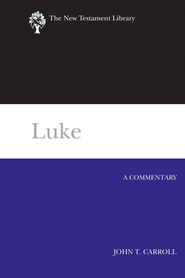 Some time back I mentioned I would be reviewing a handful of books, one of which is John T. Carroll‘s Luke: A Commentary (The New Testament Library; Louisville: WJK, 2012). The following is part one of my review, having had the chance to thoroughly read the introduction and use a good portion of the commentary proper. I would classify Carroll’s commentary as semi-technical with a broad target audience, owing in part to the purposes of the series of which it is part. It comes in at just over 550 pages (including indices) which, for the Gospel of Luke, is about the right length for an adequate pericope-by-pericope analysis (but not verse-by-verse). Even so, Carroll is able to cover a lot of ground in a short space, and most of the time he does so without sacrificing his prose. The introductory and summary paragraphs that introduce units of text are especially well-written. The nitty-gritty commentary sometimes feels a bit clunky, as is the case with most commentaries. In spite of sparing interaction with secondary sources (I assume this owes again to the purpose of the series) Carroll makes room for brief commentary on text-critical issues. Noteworthy is that Carroll follows the Western non-interpolations of D in Luke 22 and especially 24 (Luke 22:19b­–20; 24:3, 6, 12, 36, 40, 51–52). On Greek grammatical and syntactical issues I found the commentary wanting. I noticed two issues right off the bat: (1) Claiming the traditional view that the perfect tense indicates a past action with present results (this was applied to the substantival participle in Luke 1:1- τῶν πεπληροφορημένων); and (2) Applying the Granville Sharp rule (which states that an articular, singular noun followed by kai and an anarthrous noun share the same referent) to two plural nouns (“eyewitness” and “ministers of the word” in the preface of Luke). This is true of most commentaries coming off the press today. I am not sure if authors are simply not sure how to incorporate recent linguistic studies in exegetical discussions or whether they are just ignorant of the issues altogether. I have to say that I do not understand half of what you are saying, but I find it fascinating! Continue your studies with the passion that I know you have and I will continue reading your reviews. Larry, nice to hear from you! Thanks for the encouragement. Lot’s of jargon here, I know.